I waited for my Carte de Sejour extension. If you are like me and you live some place that you like, any threat that might change your place of residence is one that is difficult to ignore. For residents of France, a carte de sejour must be renewed every year regardless of the type of visa you have. Unlike those countries where you can simply shoot the paperwork off to your lawyer and never step foot inside an immigration related building, French immigration is up close and personal. Here you have to do everything on your own. It is possible to hire a lawyer, but they can only assist you in filling out your papers. They can't go to your meeting with you or argue on your behalf. When I lived in the US, I found that paying a few thousand dollars for a lawyer was a bargain in that it saved me so much grief and anxiety. So, despite having retained a lawyer here, I could see no use for her services since the worst part of the process is the meeting and there is no way to avoid that. 1. 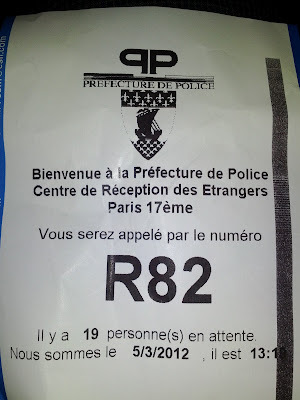 THREE MONTHS before your old carte de sejour expires you must make an appointment to renew it. Do NOT forget to do this or let the date slide or you will find yourself back in your country of origin. Here is the link for where you create the appointment. One more year of fencing in Paris! Bal des Princesses at the Pavillion Royale. 2. When I went to renew, I had made a mistake. First, I put the wrong "N° de votre titre de séjour" that they asked for on the form and the website did not make me an appointment. Thinking I had a lot of time, I waited and eventually went into the police prefecture to see what I should do. 3. PANIC! I learned that though I had an expiration date on my carte de sejour (your first one is tacked inside your passport) that the expiration date of the visa was the drop dead date, not the anniversary date of the carte. I learned I only have ONE MONTH LEFT! I was ready to panic and the woman at the counter was helping me to panic, when they had an idea that I could get an extension. 4. They compelled me to get extra paperwork related to my landlord, including proof of ownership of the apartment and their passport information. Sheesh! What could I do? I asked my landlord for the stack of documents and they provided it a couple of days later. What luck that I have great landlords! 5. I went to the main police prefecture to apply for my extension. Ordinarily the renewals are done at your local prefecture. The main prefecture had a long line of people from every country you an imagine... all with the same goal... to stay in Paris another year. The line seemed not to move, but by the end of the day I did get to a desk with a nice lady who eventually gave me my extension and set me up with an appointment. For two months from the extension. One more year of art galleries and museums! 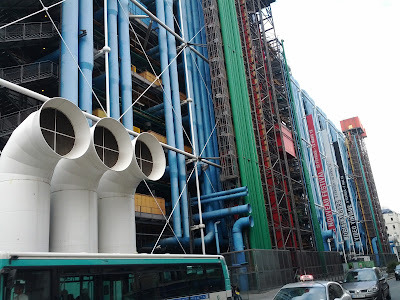 Taken from the front of the Centre Pompidou. 6. Back to the normal process, I had my extension and an appointment... which I could have avoided had I followed step 1 correctly. I collected my paperwork, the most important of which (well honestly I don't know if anything is unimportant to them) were my insurance papers, my lease/rental information and my bank statements showing that I still had income. 7. For most paperwork, call the people responsible such as your health insurance company and your bank. Tell them you are applying to renew your carte de sejour and they will know what to give you for 'attestations' before you even ask. Make extra sure that you have all the ancillary paperwork such as a long-form birth certificate or anything you need from the mainland. 3 months seems like a long time, but when you have to wait a month for a piece of paper... the time shrinks fast. One more year of learning to draw! A one minute and 30 second sketch in a series of studies from a recent art class. 8. In my case, I had last minute drama. I lost my birth certificate days before my appointment. Ahh! There was no time to get a new one. Friends, I had a scan of my birth certificate and made a copy. This was enough for the meeting. DO make sure you have scans of your birth certificate, passport, visa or any other important document and that the scans are in a safe place. 9. My meeting was at 10:30 am. I normally wake up at 7 or 8, but because I could not sleep the night before, I woke up at 10:20. DO learn from my mistake. Set an alarm, have a friend call you or both. Make sure you are awake and at the meeting. I managed to run to the appointment and arrived only 10 minutes late, paperwork in hand... filled out the admittance form and waited to see my judge. I waited 2 hours and drained my phone battery playing Angry Birds. 10. The prefectures seem to pride themselves upon being unilingual. Once in the meeting, there was little conversation except a couple long French sentences that I didn't understand. I had to reply and did so in half French/English. I was nervous and could speak neither language. The adjudicator told me that I should learn French, because if she was applying for the same thing in the US, she would need to speak English. I wanted to remind her that I'm Canadian and that the Canadian government would happily serve her in both English and French, but I kept quiet. I'm not crazy, just proud. One more year of princesses! 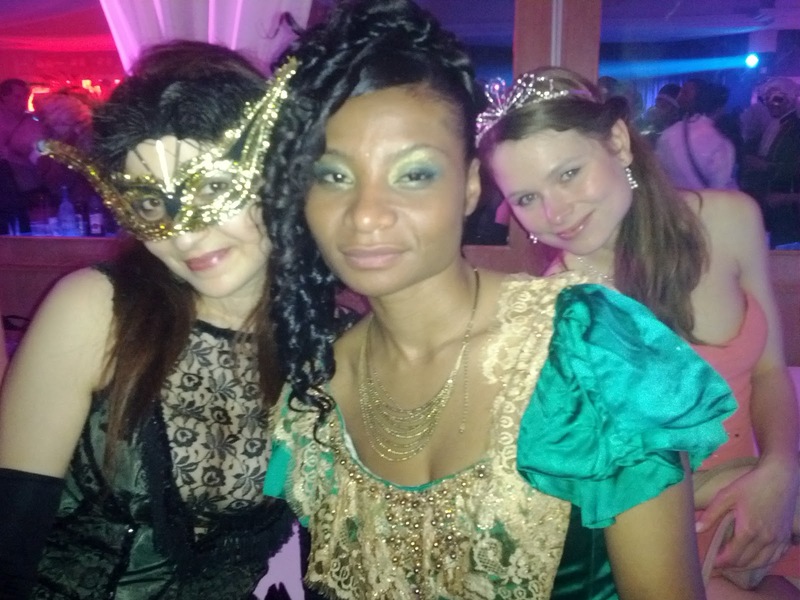 Three of my dates to the Ball des Princesses at the Pavilion Royale. 11. After about 10 minutes of looking at my papers without comment, my adjudicator fed a form into a special dot-matirx printer which got all churned up and came out with my information on it. I was done. Mission accomplished! 12. Because this is my first renewal, rather than a new sticker for my passport, I'll receive a separate card. I'll post a pic later. For now I have a temporary carte printed on paper and I get the permanent card in 2 months. It will cost around 100 Euros in those crazy stamps from the tobacconist. and no more worries for me... for 9 more months when I start the process again. I hope this was interesting for you. Take care and post questions below if you have any. Thanks Devon! OMG, you would not have believed my apprehension. I didn't let on to anyone but this has been really gnawing at my soul. I'm so glad it's behind me. What an interesting experience! I'm glad for you that everything turned out great. I'm here on a tourist visa which will expire in 3 weeks. I'd like to stay one more month - shall I go to the perfecture for a one-month tourist visa extension? Or do you think this cannot happen? Thanks for the detailed post! So informative. One question, can you travel with your temporary card until the permanent one is issued again? Robin, thanks for taking time to explain the process, being in your shoes right now I feel more comfortable after reading your Op.Ed. ! :) I have a couple of questions: 1. the temp paper card they gave you, was it valid for 1,2 or 3 months? 2. What was the actual wait time to receive the plastic card? 3. Have they informed you of when to come to pick it up, or you had to phone/visit them mercilessly until they told you when to come? Thank you, and thank you again ! Are you upset about not being 'served' in English? They're supposed to serve you in French or English in any Canadian government office: they can't and they don't. In Quebec some of the employees might get pissed off but they will serve you in English. 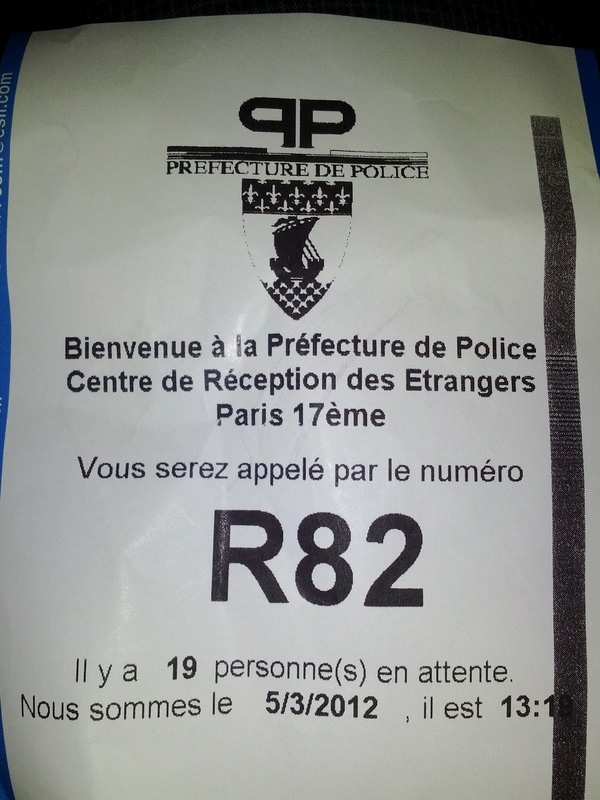 In France they have no reason to serve you in English.In a few years you'll understand that. Hi there the link you provided to make an appointment doesn't work.. could you let me know where to search or where to go to make an appointment? I am 2 months until my expiry date and have a day off on thursday to see if I can get all this sorted! my expiry date is April 18th, do you think I should just go for an extension right away? I don't want to be wasting time on my day off. Thank you....was just trying to determine if I needed to renew at the date of the visa or the date stamped on the TdS...and now I know. Merci!